UPDATE 12/12 – Toys R Us has posted the images and details on their site. This morning we found a bunch of images from an unknown website that seemed to confirm an upcoming set for Mos Eisley Cantina – 75205. We can’t show the image here as it isn’t officially released by LEGO yet. The image provides little detail, but seems to contain only 4 minifigures. Greedo, Han Solo a stormtrooper, and the bartender Wuher. The Mos Eisley Cantina is from the original Star Wars: A New Hope movie and was central to the early part of the story. Establishing Ben Kenobi as a fighter and bringing our central team of Luke, Ben, Han and Chewie together. The oft-quoted theory that “Han shot first” comes from a scene in the cantina where Han meets Jabba’s hired hand Greedo. 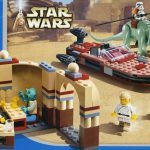 LEGO first released the Mos Eisley Cantina in 2004 as a relatively small set (4501) with around 200 parts including the lovely Dewback and 5 minifigures. The set is very focused on the scene where Han and Greedo are talking in a booth after Luke and Ben have made their deal. The Cantina was also released in 2014 as set 75052 and the prevailing opinion right now is that that original set is still better than this one. It does seem like it’s a much larger set. Updated to include the 4501 set information.